Hey Lovelies! The last challenge was 4 weeks, and we had to make something for HomeDeco! A pretty wide challenge you would think. But when you know what you are allowed to use, and what not, there is not much left anymore. Because we were only allowed to order Yarn.. was that also the only thing you were alowed to use. So, no stuffing, no glass, no stools, no lampshades etc. So all the fun things were not allowed, Great! I even asked if it really wasn’t allowed.. *sigh. Oh well, we should do it with what we have right?! De laatste opdracht was 4 weken, en we mochten iets maken wat te maken had met HomeDeco! Een vrij ruime opdracht zou je denken. Maar als je bedacht wat we mochten gebruiken, en wat niet, bleef er niet zo heel veel meer over. Omdat we alleen garen mochten bestellen.. was dat ook het enige wat we mochten gebruiken. Dus, geen vulling, geen glas, geen krukjes, geen lampenkappen, enz. Dus alle leuke dingen waren niet toegestaan, great! Ik heb het nog nagevraagd of het echt niet mocht… *zucht. Ach ja, we moeten het doen met wat we hebben. 1 van mijn ideeën was om een planten set te maken, maar daar heb je vulling voor nodig, dus, doei idee. Ik had ook nog gedacht aan een vloerkleed, maar ik weet, dat ik die zelf nooit zou gebruiken vanwege mijn kat. Dus heb ik uiteidelijk gekozen om een mega woondeken te maken. Ik dacht dat dat een goed idee was… maar.. The first 2 weeks, I only designed 2 large squares. More.. I couldn’t do. I was done, no energy left at all and my body hurted so much. I was about to give up on this contest several times. 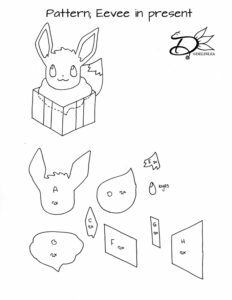 What you don’t really see in the episodes is that this contest has really tight deadlines, where we have to come up with a plan, order yarn, make the item, block it if needed, write the pattern and make all the pictures. It is too much if you still have a life besides it. I felt often like I had no time to breath, and in my head it was often ‘No rest for the wicked’. De eerste 2 weken, heb ik alleen 2 grote vierkanten ontworpen. Meer.. kon ik niet doen. Ik was op, geen energie meer en mijn lichaam deed overal pijn. Wat je niet echt ziet in de afleveringen is dat deze wedstrijd hele strakke deadlines heeft. In die tijd moet je een plan bedenken,garen bestellen, alles maken, blokken als nodig, patroon schrijven en de fotografie. Het is teveel als je daarnaar nog een normaal leven hebt. Ik had heel vaak het gevoel dat ik niet eens tijd had om te ademen. Er ging ook heel vaak door m’n hoofd, ‘No rest for the wicked’. Anyway, My idea for the blanket was inspired by the theme Love Yourself, by BTS, A Korean pop group. It’s so important to love yourself, but there’s create such a ‘perfect image’ you need to have. That, when you are different, have an illeness or what so ever, we usually hide it. How can we love ourself then?! We need to be able to be ourself, Love Ourself, and it’s a must people get aware of that! Anyway, mijn idee voor de woondeken was geïnspireerd op het thema Love Yourself bij BTS, een Koreaanse Pop Groep. Het is zo belangrijk om jezelf lief te hebben, maar er is zo’n perfect plaatje gecreëerd in de hedendaagse cultuur, dat, als je anders bent, ziek bent of iets anders, we het meestal verstoppen, hoe kun je dan jezelf lief hebben?! We moeten onszelf kunnen zijn, onszelf lief kunnen hebben, het is zo belangrijk dat mensen hier bewust van worden! I love the colors I used, I was about to use white white, but I am glad I didn’t. This way, the look of it, it’s warmer, with the use of cream. It would be colors I would pick myself, but BTS also used it. So perfect match! I love de kleuren die ik heb gebruikt. Ik had bijna wit wit gebruikt, maar ik ben zo blij dat ik dat niet gedaan heb! Met Cream, lijkt de deken warmer te ogen. En de rest van de kleuren zijn kleuren die ik zelf zou kiezen, Maar BTS had deze kleuren ook gebruikt. Dus perfecte match! 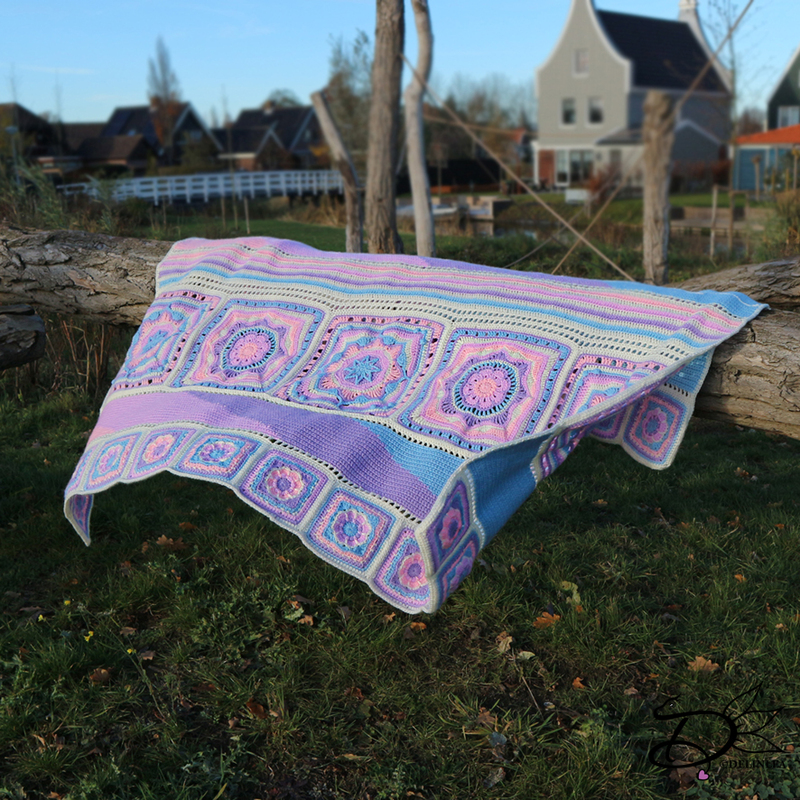 In the end I made my blanket of 180 by 150 cm in about 2weeks. It’s ridiculous, and I have no clue how I managed to get that done. But I did, it’s a miracle. (If something is in my head, I will make it that way, no matter what) I changed some parts up tho. Like where the hearts are, should have been flowers, and the hearts should be in the other 2 parts. And I also wanted to use BTS logo in there, but that didn’t look right, and became stripesxD. Uiteindelijk heb ik een woondeken van 180 bij 150cm in ongeveer 2 weken gemaakt. Het is te gek voor woorden, en ik heb geen idee hoe ik dat gedaan heb. Maar ik heb het toch echt gedaan, het is een Miracle. (Als ik iets in mijn hoofd heb, krijg je het er niet meer uit, hoe dan ook, zal het gebeuren) Ik heb wel wat aanpassingen moeten maken. Zoals waar de harten nu zijn, daar hadden eigenlijk bloemen gemoeten en de harten in de andere 2 delen. En ik wou eigenlijk ook het logo van BTS er in verwerken, maar dat zag raar, en werden strepen xD. Anyway I am happy with how it turned out, even though there are some flaws, that if I had more time, I could have done better. But who cares xD only me probably xD. Ach ja, ik ben blij met hoe het eruit ziet, ook al zitten er wat foutjes in, dat, als ik meer tijd had gehad, beter had kunnen doen. Maar who cares, waarschijnlijk alleen ikzelf xD. I hope you like what I created, even with knowing the story behind it now! Make this one for yourself, or for someone that deserves the love! Wrap yourself in it, keep yourself warm, that’s already a tiny thing you can do, on your way to love yourself. Ik hoop dat je het mooi vindt wat ik gemaakt heb. Zelfs nu met het verhaal erachter! Maak deze deken voor jezelf of voor iemand waarvan jij vindt dat die wat liefde verdiend! 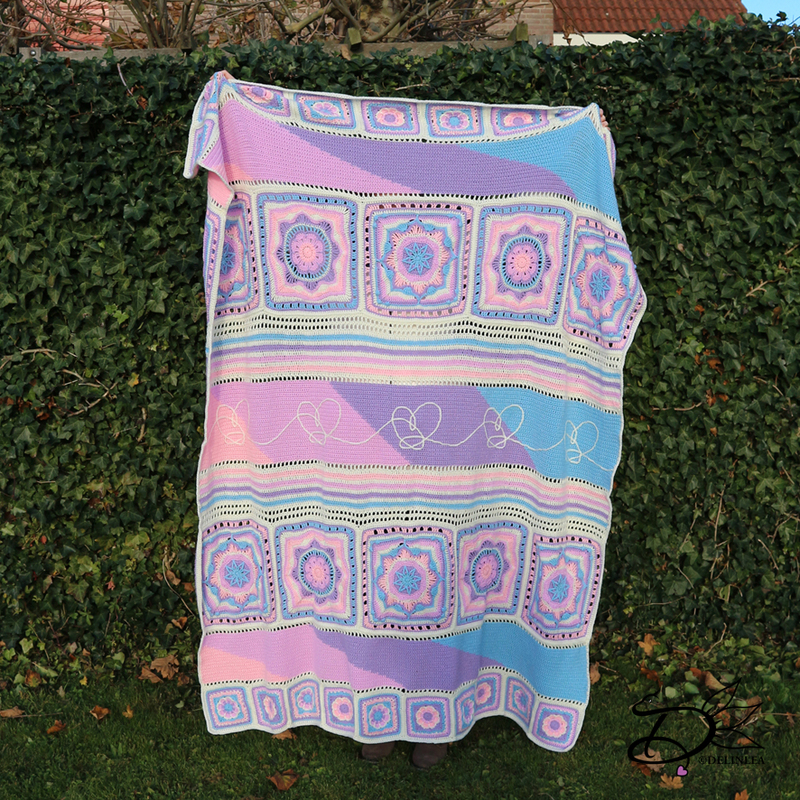 Wikkel jezelf erin, hou jezelf warm. Dat is al een klein iets wat je kunt doen, op jou weg om van jezelf te houden. I love you all! No matter how you look, what your gender is, how you indentify or not, have an illness and all the others things I forgot to write down. YOU ARE GOOD THE WAY YOU ARE, FEEL LOVED!! Ik hou van jullie allemaal! Het maakt niet uit hoe je er uit ziet, wat je geslacht is, hoe je je indentificeer, ziek bent en alle andere dingen die ik heb vergeten op te schrijven. JE BENT GOED ZOALS JE BENT, VOEL JE GELIEFD!! Hey Lovelies! Day 11 of Blogmas is here! And time for another felt ornament, and I thought, how cute would Eevee look in a presents box! So let’s make that! ♥ Felt in the colors Brown, Beige, Red and Green. ♥ Sewing thread in matching colors to the felt. 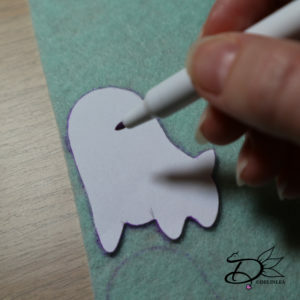 ♥ Trick Marker or anything else where you can copy the pattern with on to your felt. ♥ Acryllic Paint in Dark Brown and White. 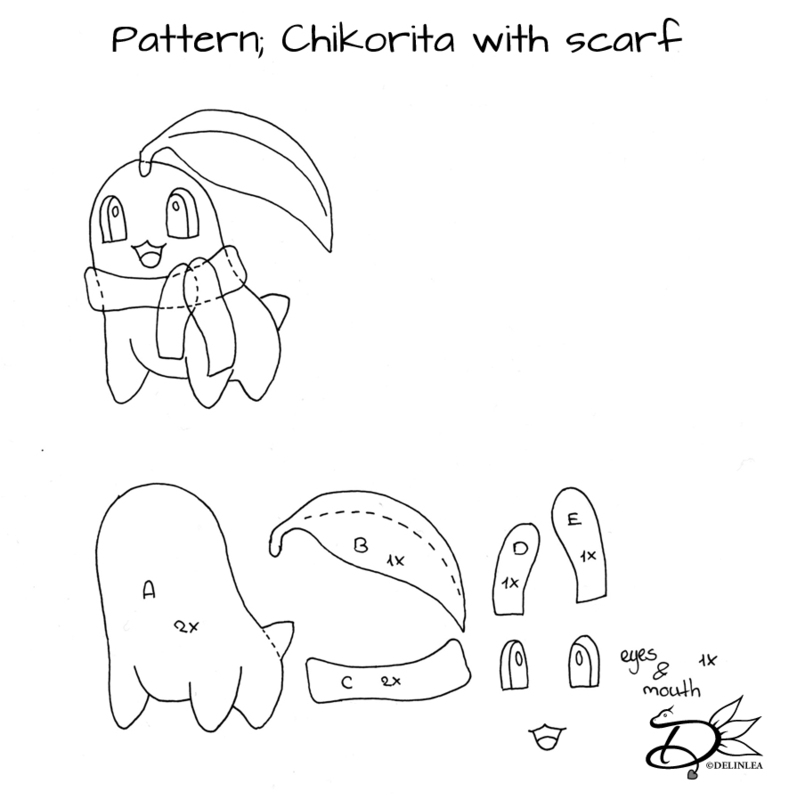 First off all, download the pattern HERE! And print it out (or draw it from your screen). The good thing is, you can make it as big as you want! Then cut out all the pieces. 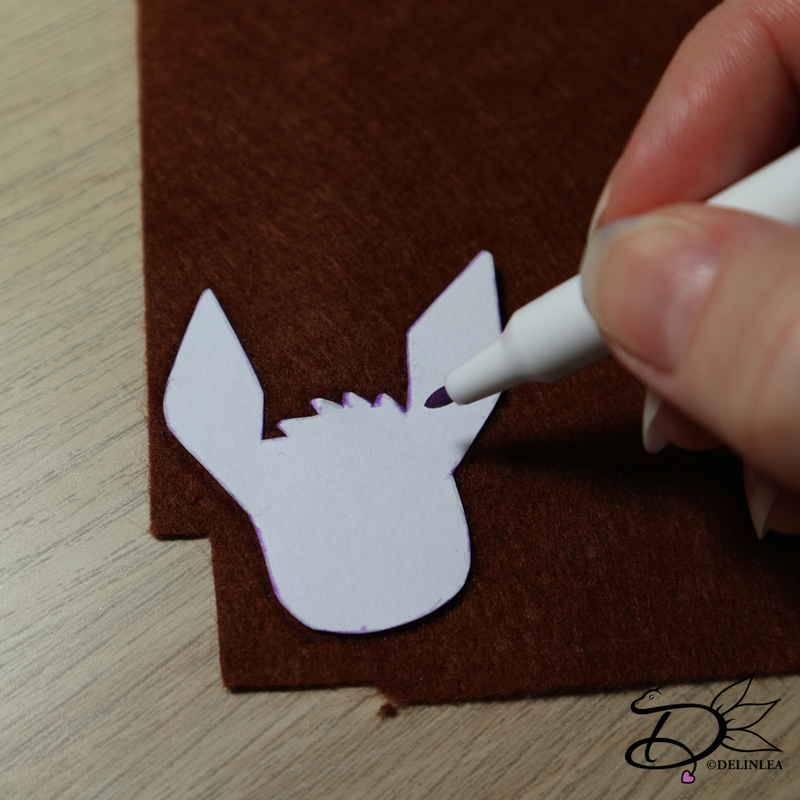 On every piece is stated how many times you need to cut it out of felt. 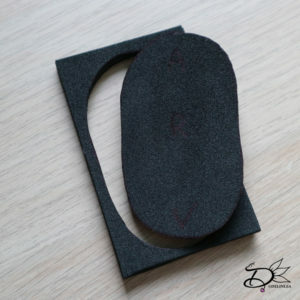 Cut part A and D out of Brown felt, B and E out of Beige felt, F and H out of Red felt and G out of Green felt. Part C you can also cut out of dark Brown felt of you can paint it on like I did. For the eyes the same, depends on what look you are going for. 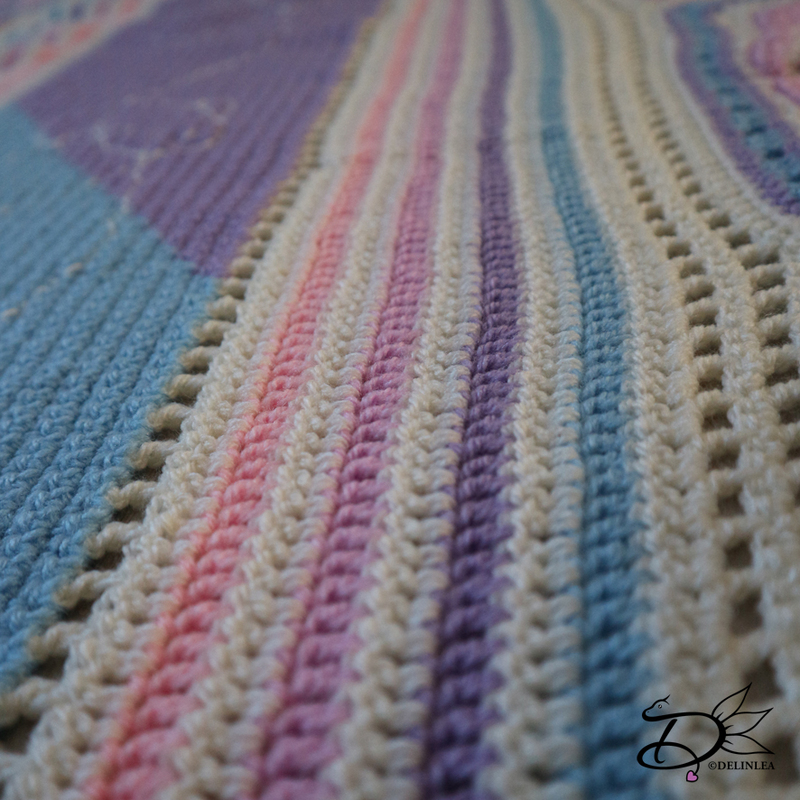 Sew parts A together with a Blanket stitch, this stitch you will use through this whole diy. Make sure you stuff the ears already when you have finished sewing those. Other wise you won’t be able to. And before entirely closing the head, stuff it as well. 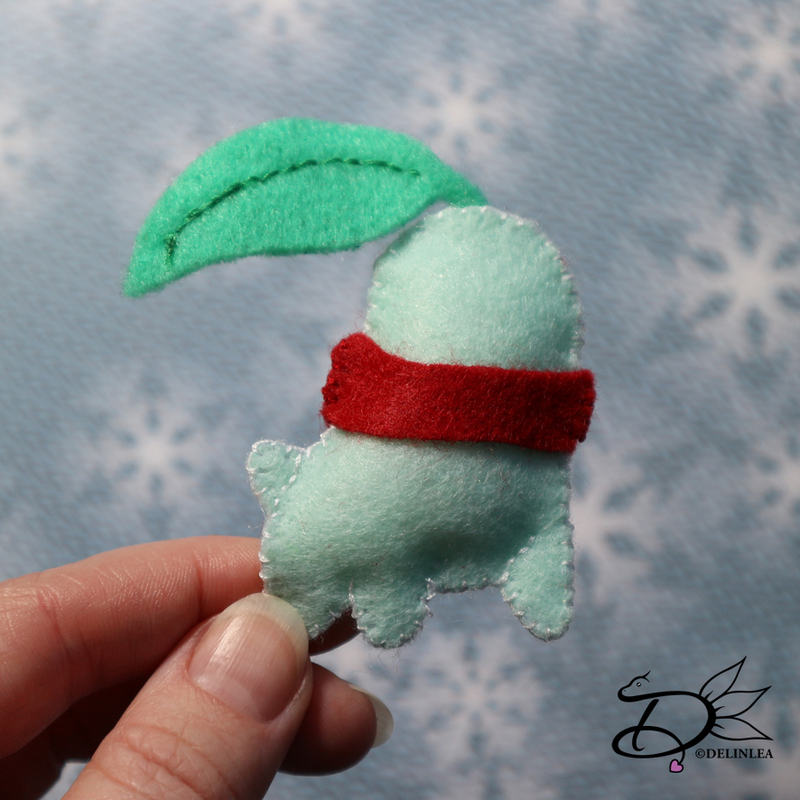 Sew Parts B together as well, and don’t forget to stuff.Stitch of glue part A to part B. Place part E on part D for the tail. You can stitch or glue this on, but you can also leave it as it is, and only sew the outer edges, while you sew the whole tail together. What you will be doing now. Paint on the eyes, nose and mouth, and the inside of the ears if you chose paint. Or place the felt eyes, etc. now. Time to make the box!! Sew part F in the middle with the same stitch to each other. Do the same for part H. Then glue or stitch part G to parts F. Now place parts F on top of part H and sew these together. 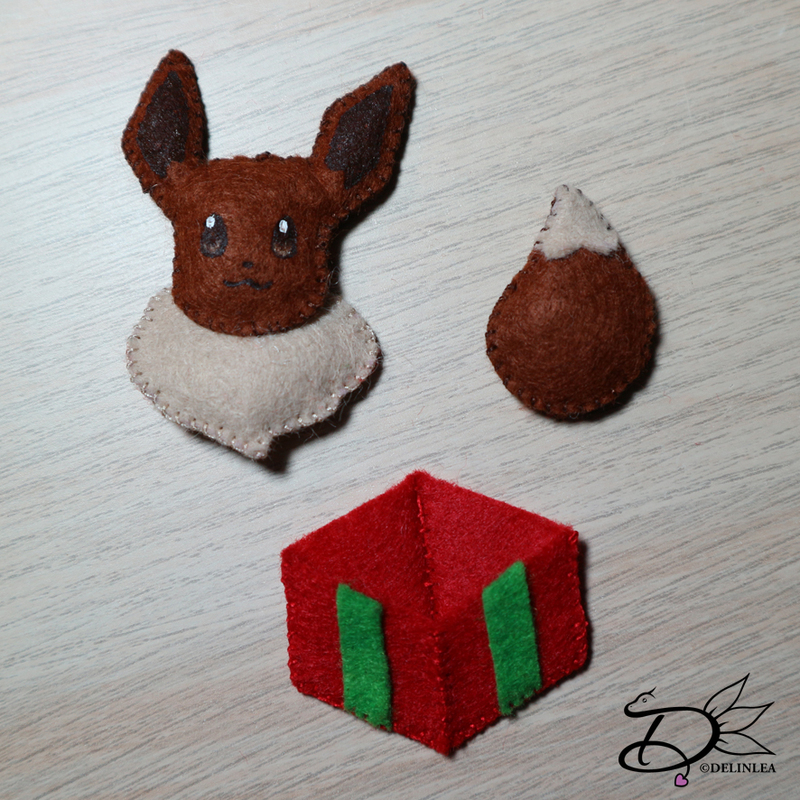 Now you can put Eevee in the box, I used glue to do that! And he’s already done! cute right?! Oh! And if you make him, don’t forget to share with #DelinleaBlogmas2018DIY or DelinleaDIY. Have a wonderful day and I’ll see you tomorrow! Styrofoam Cone of 27cm high. 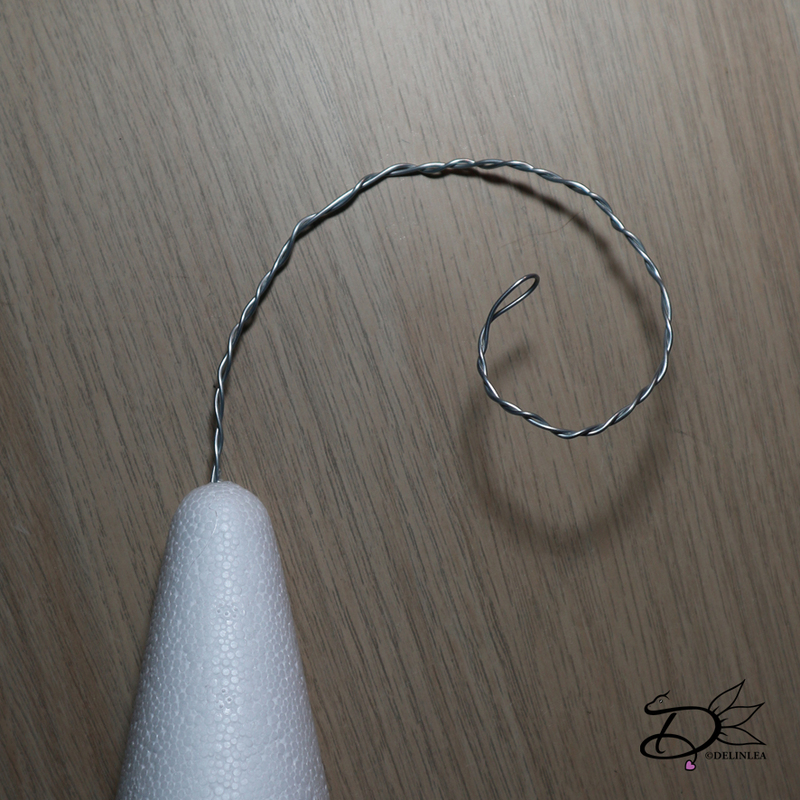 Make a hole with a scewer in the top of the cone, that’s where the wire will go in. 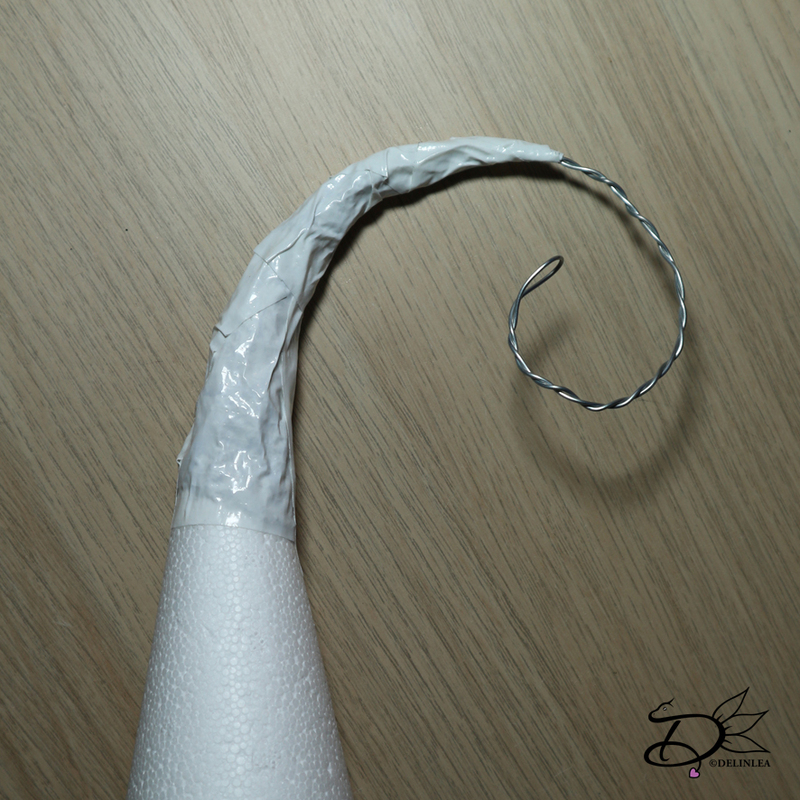 Glue the wire to the top of the cone. And make a curl in it. 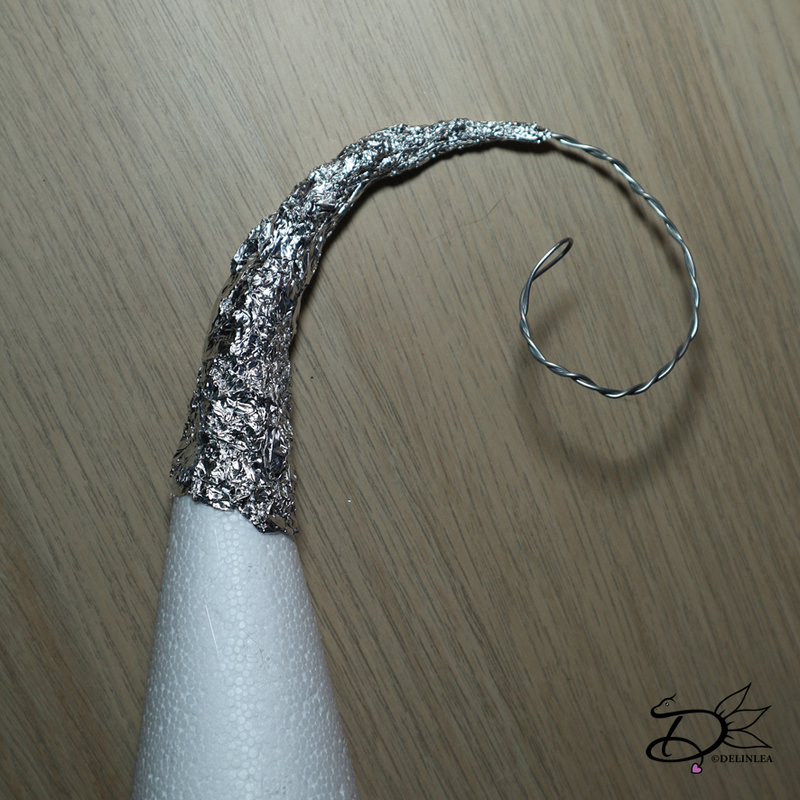 With Aluminium foil, you will create a smoother shape from the cone to the wire. 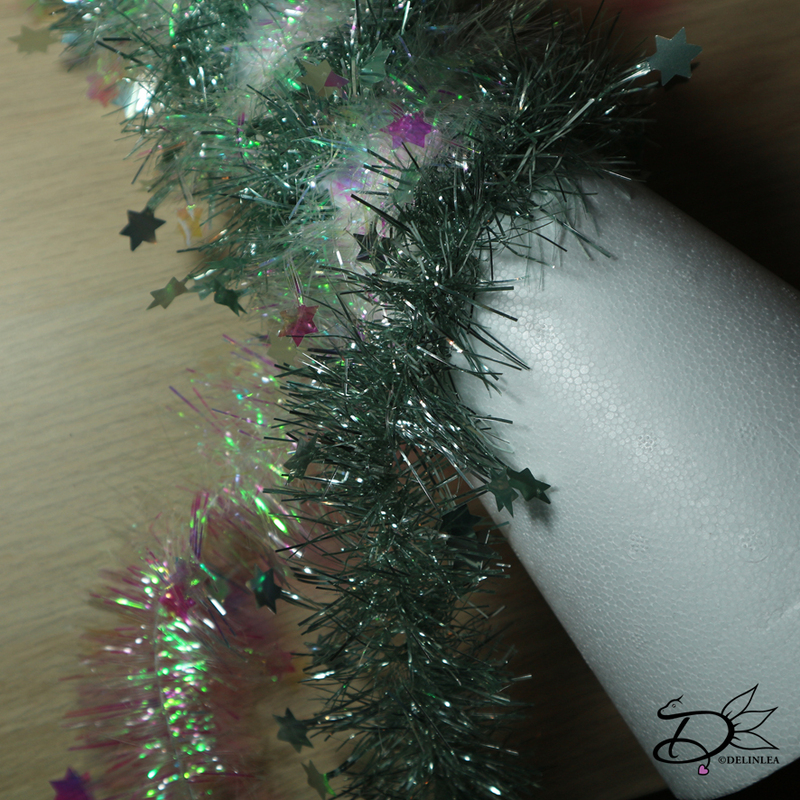 Cover the aluminum foil with the white Duct Tape, so it doesn’t show so much when you wrap the garlands around it. Wrap the garlands around the tree shape, start with both at the top of the tree, where the wire is. Glue this tight. And start wrapping it nice and slowly down. Make sure you glue them to the tree shape every now and then, so it won’t fall down. Now, you can leave it like this and decorate it, oooorrr.. you can something fun!! Let’s give it legs!! It will give it that little extra jolly! I have made the boots for the tree myself, but ofcourse you can also buy them to make it easier and quicker. It’s up to you! 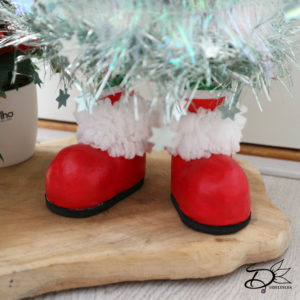 Make with Aluminum foil boot shapes. Make sure they are about the size. 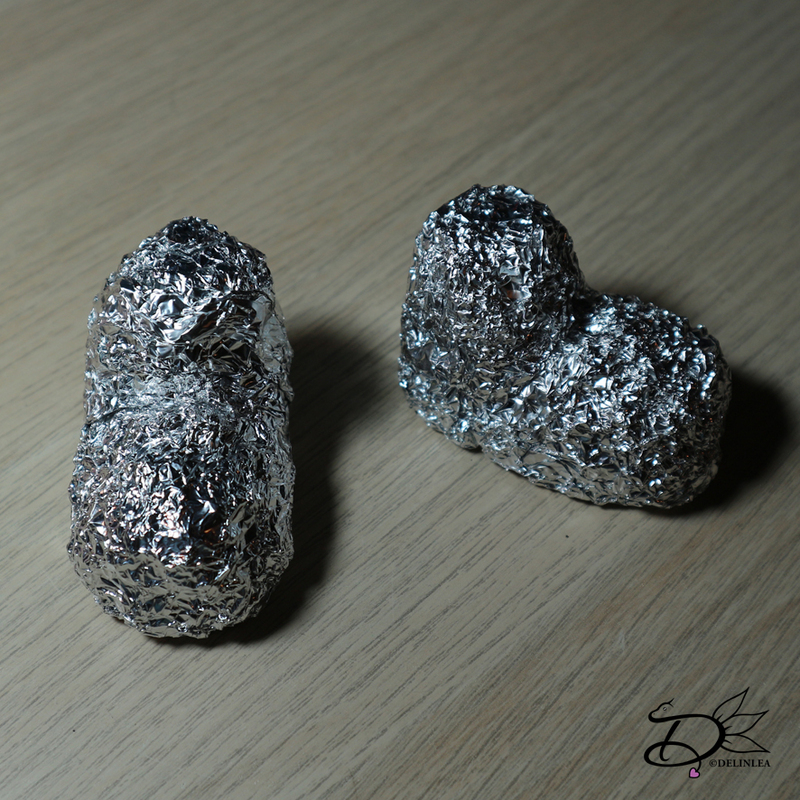 Cover the foil with air dry clay or oven bake clay. it’s up to you. I have use air dry since, I was able to wait xD. Make sure you make a small hole with a scewer where te legs should be, this is for the wire later. When the clay is dry, or out of the oven and cooled down. Trace the boots on paper, this you will need for the soles later. 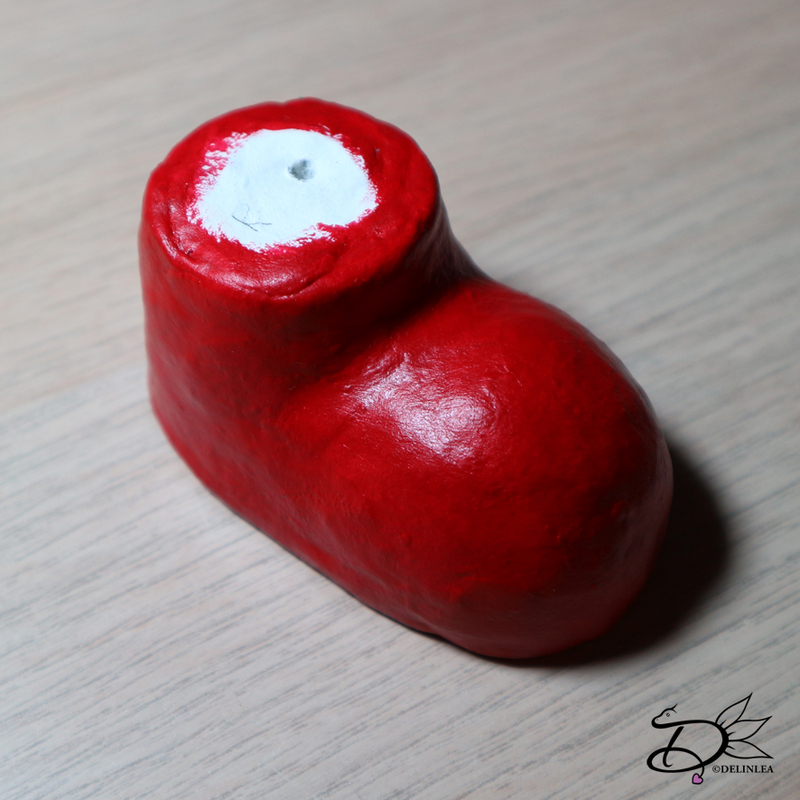 After that, it’s time to paint them, I have used Redpaint, but it’s up to you what you like! When those are drying, get out your black foam. From this we are gonna make the soles for the boots. Why? Because this way the boots won’t get damaged or the surface they are on, won’t get damaged. You, ofcourse, canmake those out of clay as well, if you prefer. 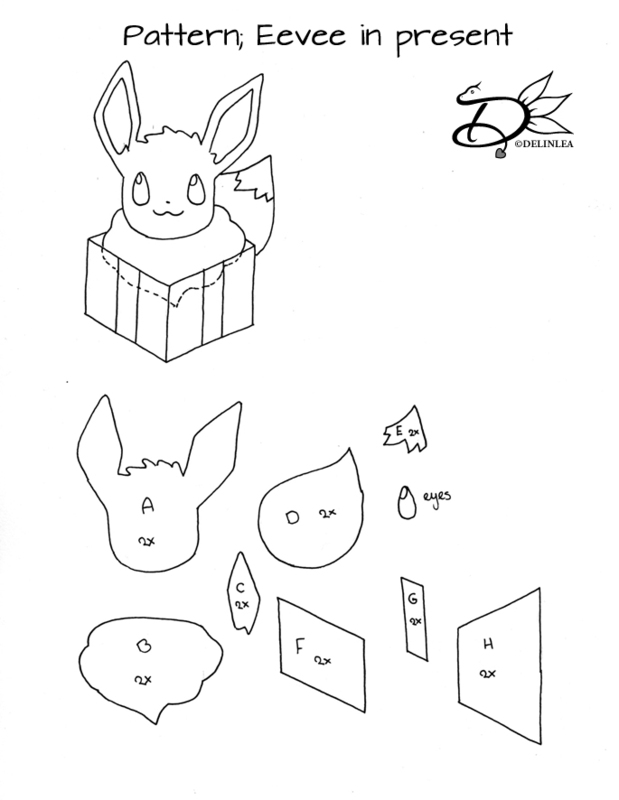 Trace the template you made earlier on the faom, keep track of what’s front andback, and if it’s left or right. Cut these out. If you’re paint is dry, you can glue on the soles to the boots. Now you’ll gonna need your white faux fur. I used a piece of 14 by 4 cm (But make sure this is enough in length for your boots). In length I glued the top and bottom parts to the middle. So the inside of the fur is covered. Now glue this to the top of the boots. Glue also the 14cm wire in the holes you made in the boots. This step is optional, it’s just what you prefer, but I made some kind of pants to cover the wire. 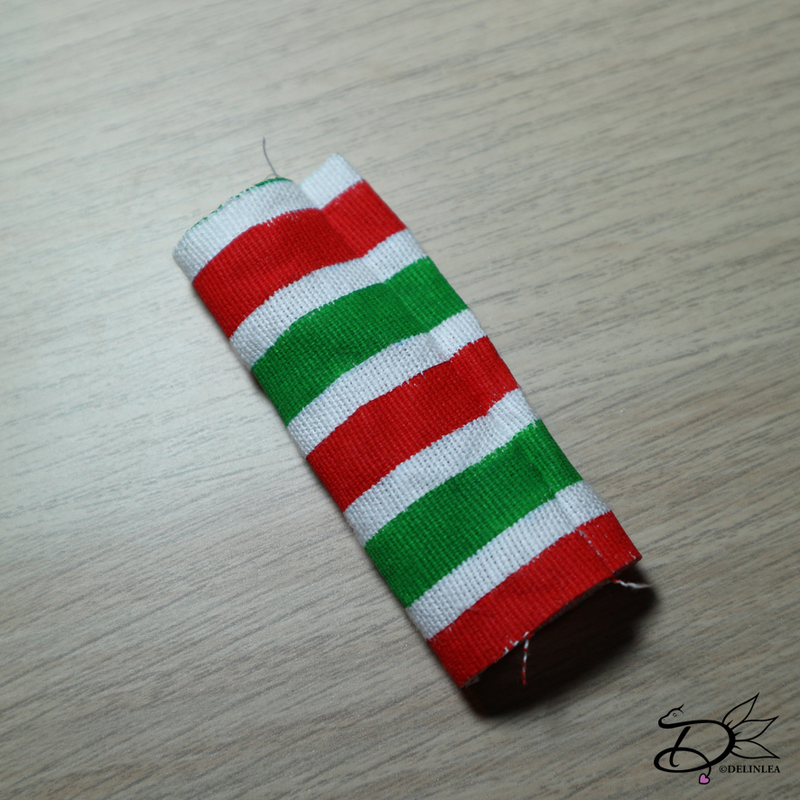 Since I had no striped green and red fabric, I used white fabric, that I painted. I Used 2 pieces of 8,5 by 7 cm. Fold it in half, with the right side of the fabric being in the inside, and line it up neathly, so you have 7 by 4,24cm. Now sew that close and turn inside out. Put this around the wire of the legs. Now it’s time to attach the legs to the tree, I drew a line through the middel of the bottom of the tree, so I knew the legs are gonna be placed at the same level. Poke a hole with the scewer where you want the legs to be. Then glue the wire of the legs in. 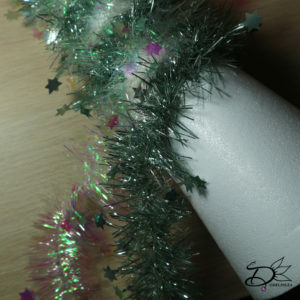 Add the star bauble to the tip of the christmas tree! And you are finished!! Love you and see you tomorrow! 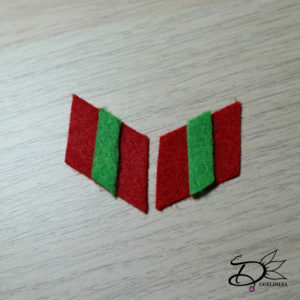 ♥ Felt in the colors Light Green, Green and Red(white optional). 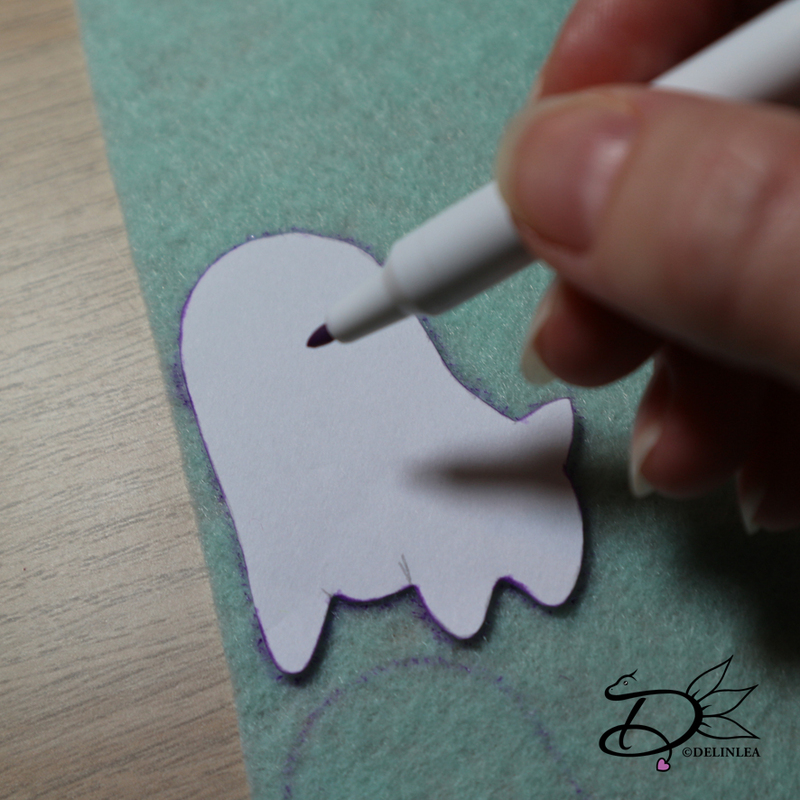 ♥ Trick Marker or anything else where you cancopy the pattern with onto your felt. 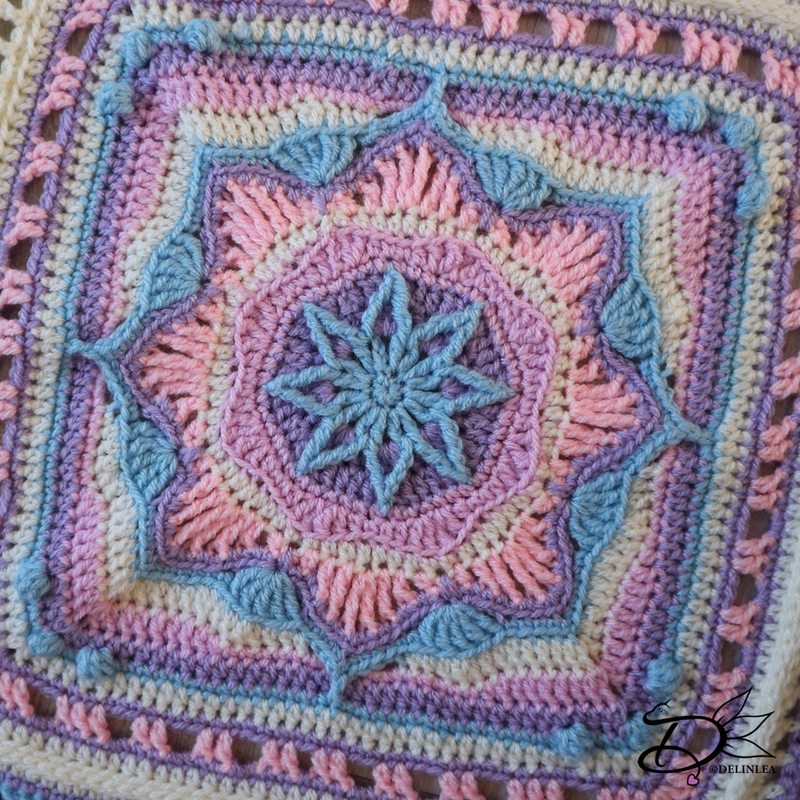 First off all, download the pattern HERE! And print it out(or draw it from your screen). The good thing is, you can make it as big as you want! Then cut out all the pieces. On every piece is stated how many times youneed to cut it out of felt. Cut all the pieces out of felt. Part A out of Light Green,Part B out of Green Felt, Part C, D and E out of Red felt. The eyes and mouthyou can either choose to make them out of Felt or paint them on like I did.Depends on what you want. Sew parts A together with a Blanket stitch. 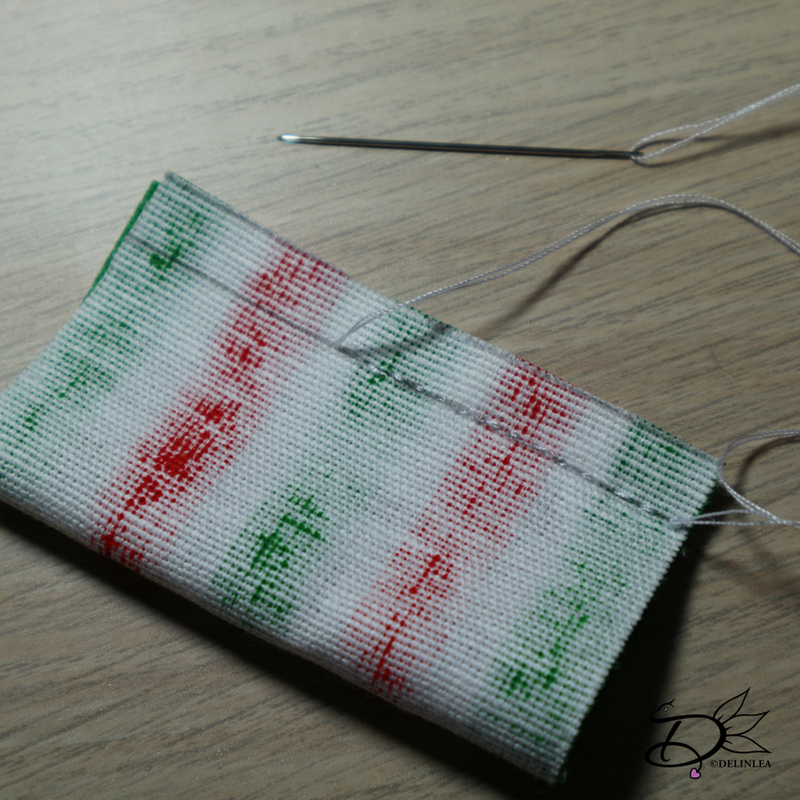 There are some lines in the body that continue, use a running stitch to make those lines, and go back the same way. 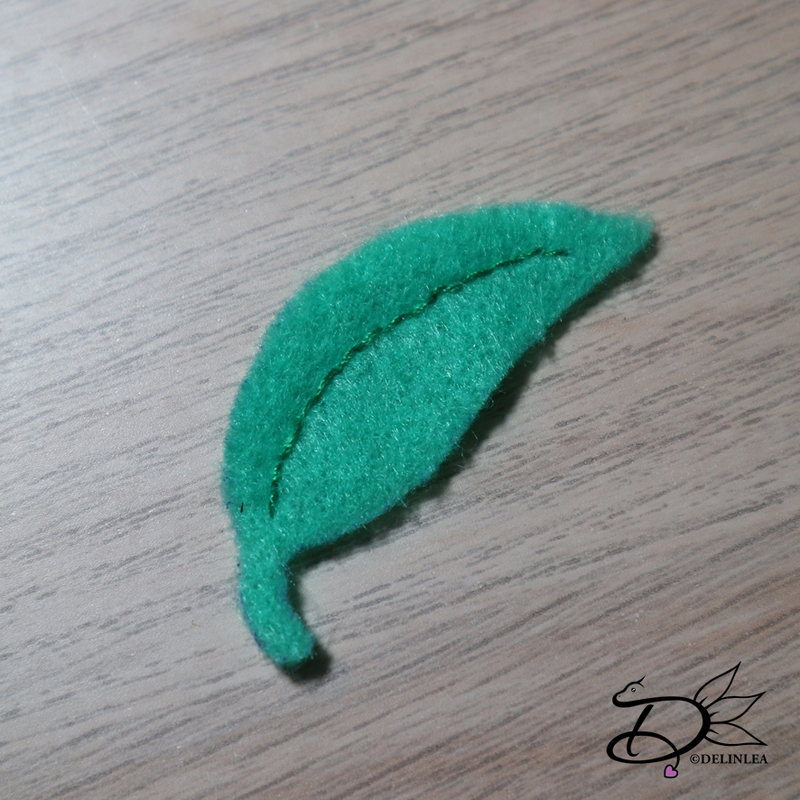 With a running stitch you’ll make the details in the leave (part B). 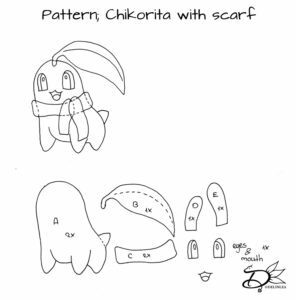 After that, you’ll glue or sew it to Chikorita’s head. Then it’s time to put on his scarf, I glued all pieces on, only on the sides of parts C I used a blanket stitch. Last but not least, paint on his eyes and Mouth. Or if you chose to make them out of felt, do that now. Hey Lovelies! 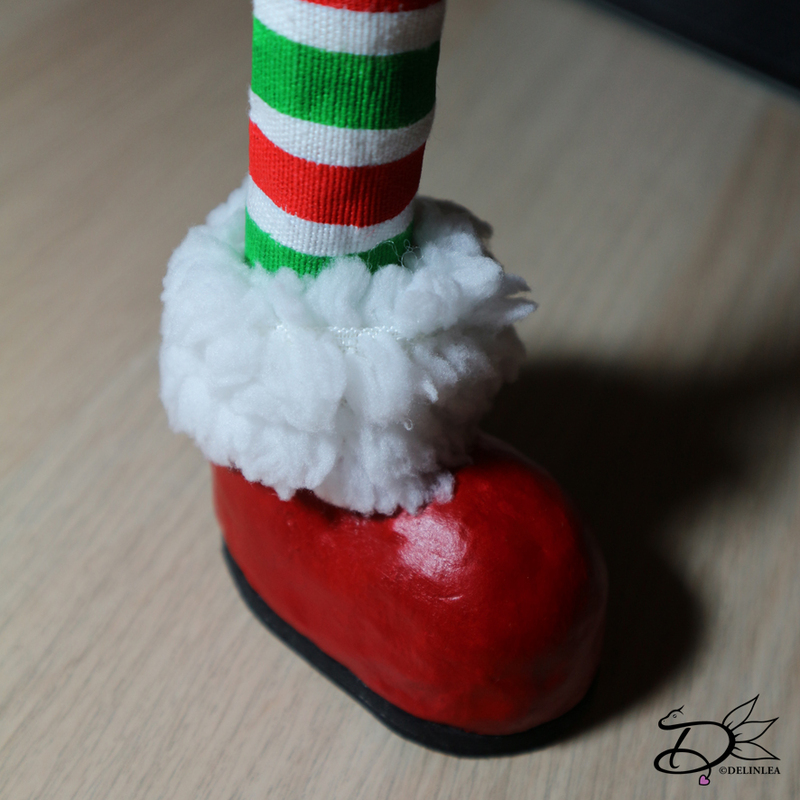 It’s day 8 of Blogmas! And that means that weare already have survived one week! Time really flies! I hope you are havingfun so far. But for today we will have a new amigurumi! 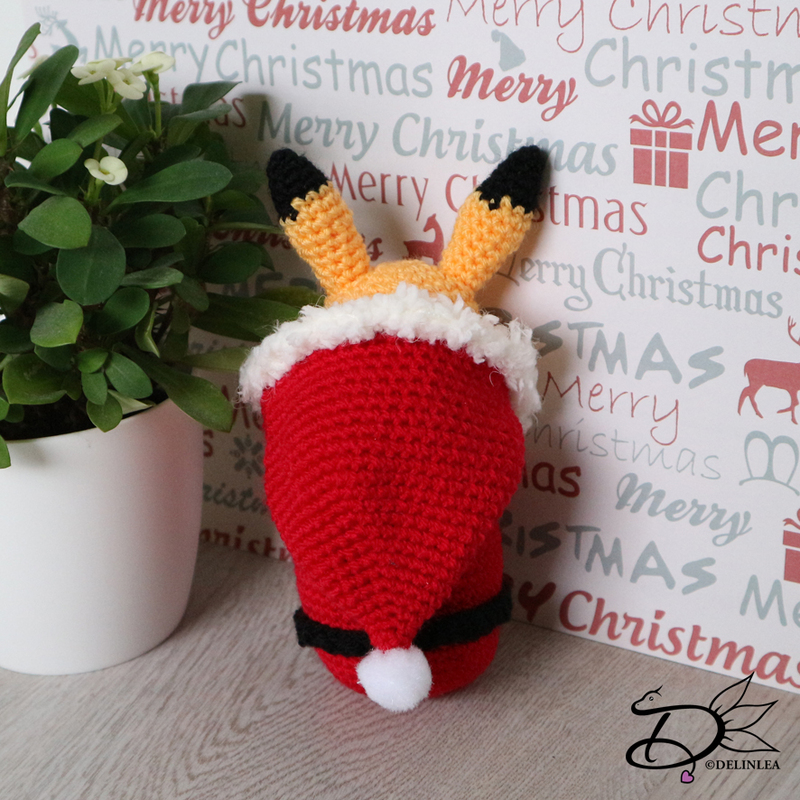 Pikachu in a Santasleepingbag! I hope you like him. ♥ Yarn, in Yellow, Black, Red and Grey. 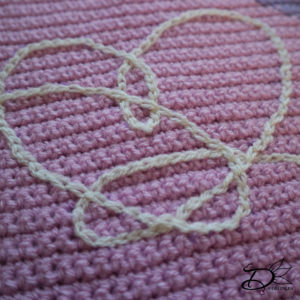 ♥ Plush Yarn in White. ♥ Felt in the colors Black, Brown andRed. 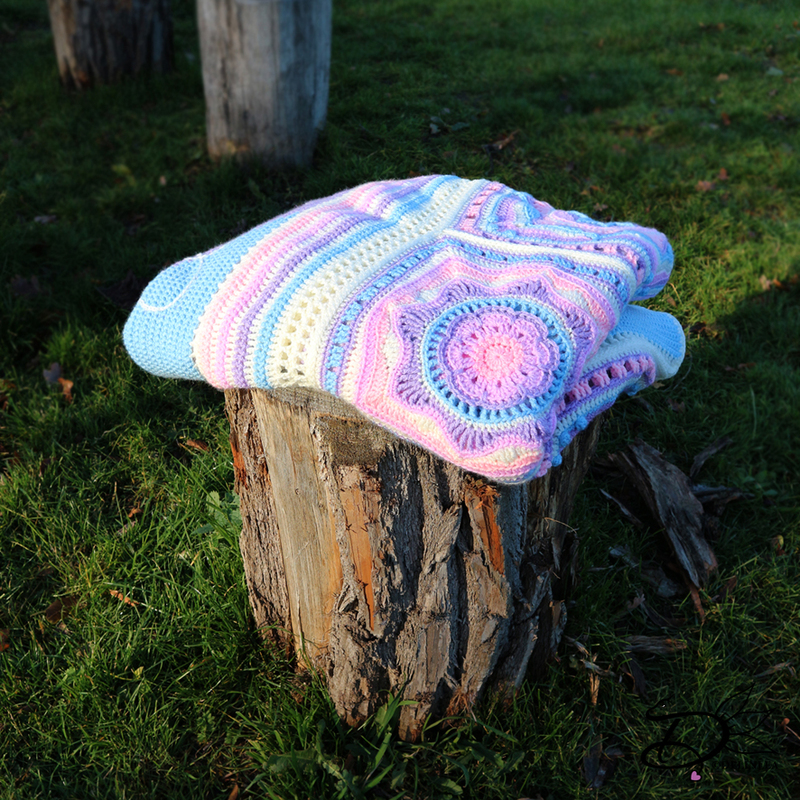 FSC = Foundation Single Crochet. Change to the White Plush Yarn. 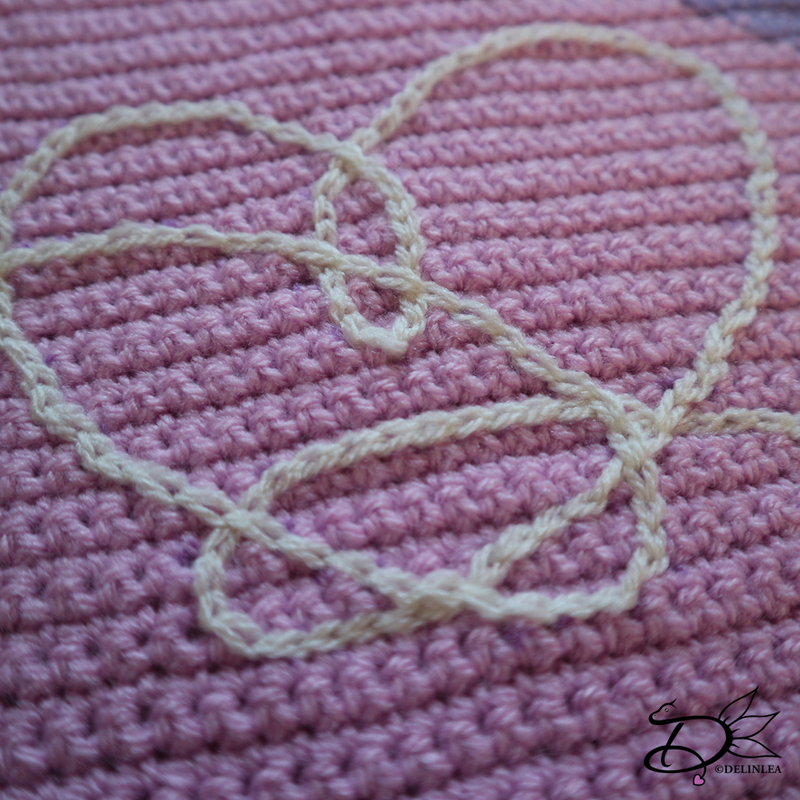 If your Plush yarn is thinner as mine, you might need to do 1 or 2 extra layers. Crochet 40 FSC! Fasten off and leave a long tail for sewing. Use some sewing pins to pin the hood to the sleepingbag.This will help you to sew it on neathly, and sew it on. Make a circle of the belt, sew both ends together. Place the belt around thesleepingbag and sew that on. The belt is not placed in the middle, but a littlelower. With some yellow yarn you’ll embroider the belt buckle on. With some grey yarn you’ll make the zipper, and finish of with a tiny piece of greyfelt. This to complete his head. Sew on his ears. 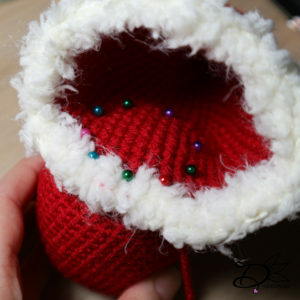 Make sure you’ll keep the head theright way, the pattern has made the shape for the cheeks already. When the earsare on, you can sew his head to the sleepingbag. 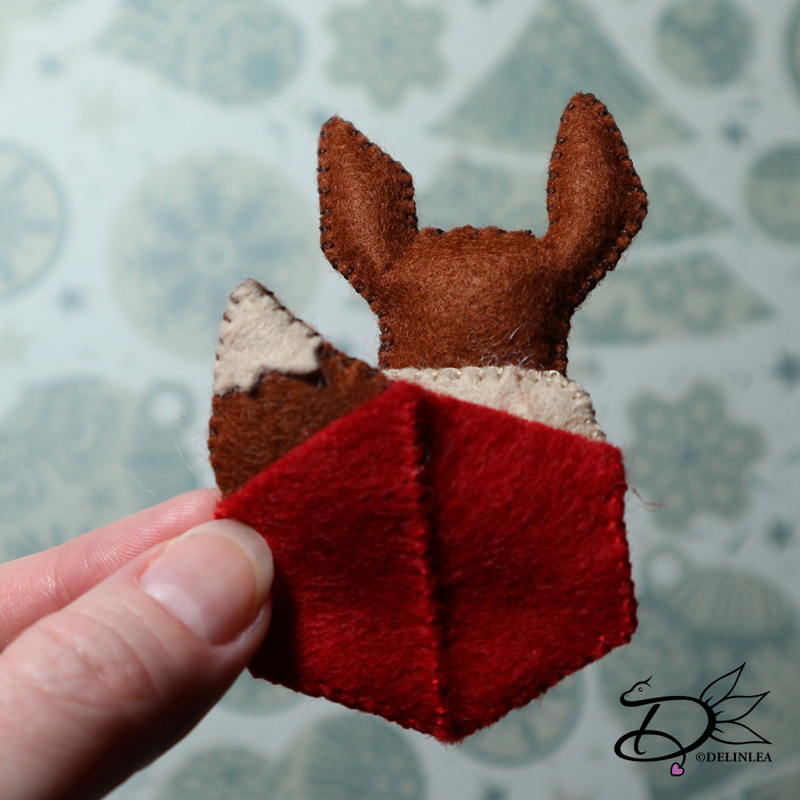 This can be a bit tricky, justuse some sewing pins to make sure it’s placed right and then start sewingcarefully. Now cut out some eyes, nose, mouth and cheeks out of felt and glue those on.For the eyes I used brown felt and colored them black so you’ll have a littleshine in the eyes. With a white dot of felt of acryllic paint in the eyes you’ll finish it off. 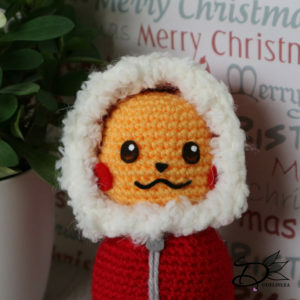 Glue or sew a pompom to the tip of his hood. And you are all done! isn’t he cute?! I hope you’ll have fun making him! and if you did so, share yours with the #DelinleaBlogmas2018DIY or #DelinleaDIY on twitter or insta. Have a wonderful day and I’ll see you tomorrow.